﻿ Fun Easy English - new classroom free online classes english language lessons speaking listening writing reading september 17. Today in the Fun Easy English classroom you are going to learn "outta" an American English reduction. Hey, let's get outta here. Do you want to move outta this city? Are you planning to get outta this company soon? You need to get outta your depression. You are way outta line. Howie: Hey Sandy what do you think of this cake? 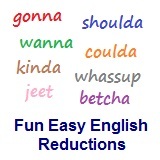 Reductions, such as outta are not real words in English.